Package deals used to be the normal way for most of us to go on holiday. They offered the best value for money and it was a fairly low risk way to see another country without any hassle or preparation. However, these days we're all a lot more independent and we travel much, much more. Budget airlines allow us to flit from one side of Europe to another and the internet gives us accommodation and everything we need to know at the touch of a button. 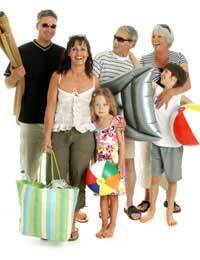 We can tailor our own holidays to suit ourselves and save money by hunting out the bargains. However, there is still a large number of people who want the donkey work to be done for them - and travel agents are coming up with ever more innovative packages in order to stay in the game. The fact remains that travel agents are more than just middle men - they have bargaining power and the wherewithal to bring together several services to make great value for money, hassle free holidays for those who want them. In order to meet the increasingly diverse demands of travellers, travel agents offer a more comprehensive service than ever before. You can still get two weeks in Lanzarote all inclusive if that's what you want, but if you're looking to do something a little different there are other great options available too - especially if you're flexible and you're open to suggestions. Another classic advantage of a package deal aside from the value for money aspect was always security - if your holiday was not what it was cracked up to be, you have a company back home in the UK to complain to. If you book your 'charming hotel just a stone's throw from the beach' online and then discover it to be a hell hole, there's little you can do about it. But what many people with a busy life love about travel agents is that it's all done for you. Families with kids, jobs, cats, dogs and an eat-on-the-run lifestyle, who want to take their two weeks in the sun and not have to think about it, can do just that after a short trip to the travel agent. Package deals do offer value for money - but only if it's the whole package that you're interested in. It is possible to find cheaper flights than those included in your package, it's also possible to find cheaper accommodation - something more suited to your tastes. If you have the time and energy you can create your own trip that is just as satisfying. The biggest disadvantage of taking a package holiday is that you feel bound to take advantage of the services included - meaning you have far less flexibility if you decide that it's not to your liking. You can't change your dates, you feel obliged to eat in the hotel and go on the excursions (even if you can't stand the other people on the trip!). In short, sometimes having it all done for you can be a bad thing. Package holidays are not for picky, discerning types who are likely to be irritated or put off by small things - they are for happy-go-lucky people who don't mind being part of a herd and aren't easily offended. One way in which travel agents make money is by taking an allocation of hotel rooms and seats on aeroplanes well in advance - for this reason they're keen to make money back as soon as possible - so, as with many things, you get a better deal if you book long before but you'll usually have to pay a deposit which is non-refundable if you change your mind. There are thousands of package deals available, from skiing trips to jungle expeditions, round the world cruises and much more. Most offer good prices for the services you get back, and if you're flexible, adventurous, sociable and adaptable in may be something you'd consider. However, if you're on a tight budget and like to keep your options open you may prefer to plan your trip in your own way.